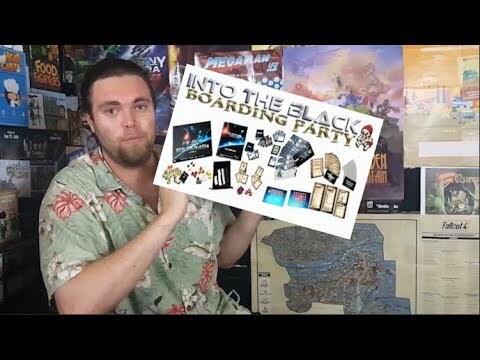 Into the Black: Boarding Party (A Game of Space Piracy) is a semi-cooperative space pirate dungeon crawl published by I Will Never Grow Up Games. You and your fellow crew mates are a fierce band of space pirates who have boarded an enemy star ship with the ultimate goal of taking control of the bridge. Along the way you will reveal the layout of the ship, encounter enemy defenders and potentially lethal events, and loot a plethora of helpful (or not so helpful) items along the way. But beware; One of your crew mates just might be a traitor, out for personal glory at everyone else's expense! Your Primary Mission is to discover the Bridge and defeat the Bridge Crew before reaching any one or combination of loss conditions (there are a dozen other Primary Missions that can be used to add variety to the game as well! Select one randomly or choose one each game).